Passed away with dignity with family by his side 12.4.2019 aged 95. Devoted and loving husband of Shirley (dec). Much loved Dad and Father-in-law of Pam and Peter, Peter and Dianne, Ian and Anne, Ross and Wendy. Adored and loved Pop of 9 and Great Pop of 20. We will miss you Dad and Pop Pam, Pete, Katherine, Luke, Oscar, Sophie, Izzy Suzi, Mitch, Javier, Archie, Lewis Andrew, Kylie, Charlotte and Nate A life well lived and enjoyed. To our dear Dad and Pop. We watched you suffer, we heard you sigh But all we could do was just stand by. We lived in hope and prayed in vain for God to make you well again. But He decided we must part, We watched you go, with broken hearts. Your life was long and full. Now it's time to rest. Your legacy will live on through your children. A special smile, a happy face holds in our hearts a precious place. Loved Dad of Ross and Wendy; Pop to Allan, Michelle and Sienna (3 weeks), Michael, Monika, Charlie and Allister. Thankyou Dad for the opportunities that you have provided and the wonderful mateship and memories we have experienced, particularly these last few years. Still as fit as a Mallee bull. 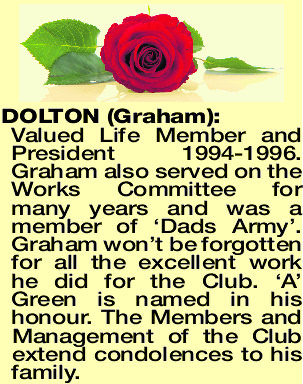 In accordance with the family wishes there will be a private funeral for Mr Graham Leigh Dolton. Sympathy and thoughts to all families. Hi Dolton, will miss our many talks on the phone. My sympathy to all the family. RIP. Carter. 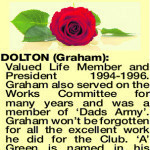 DOLTON GRAHAM Valued Life Member and President 1994-1996. Graham also served on the Works Committee for many years and was a member of ‘Dads Army'. 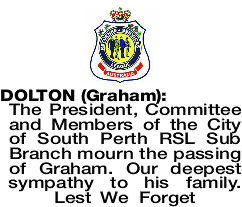 Graham won't be forgotten for all the excellent work he did for the Club. ‘A' Green is named in his honour. The Members and Management of the Club extend condolences to his family.